Different businesses have different types of needs when document and scanning solutions are concerned. Many companies have business models that can make excellent use of an overall reduction in the number of paper documents created. More and more, these businesses have transitioned to cloud-based document solutions to reduce waste and costs associated with traditional printing. However, not every business has this flexibility. If your company relies on paper printing, then eliminating paper is not an option. You want to find ways to be as efficient as possible and, potentially, even increase the scale of your printing. Perhaps you have a marketing business that relies on printing for commercial purposes. Or you might own a company that prints its own newsletters or magazines and prefers to keep these in the paper medium as opposed to moving to a web-based platform. Regardless of your reason, printing services are clearly important to your business, and Caltronics Business Systems can give you the multi-function printers you need to maximize your output. If you need a long-term copier solution, don’t just choose whatever copier is the cheapest. Caltronics specifically offers some of the best high-production, multi-function printers (MFPs) from Konica Minolta. This includes the bizhub PRESS 1052, 2250P, and C1070. Caltronics also offers specialty printing MFPs like the MGI JetVarnish 3DS and the bizhub PRESS C71cf. All of these MFPs can print much faster than most standard printers. You also are given increased flexibility in terms of features with large touch panels and more settings than most businesses need. Each of these color copiers can fit thousands of sheets at max capacity—enough for any large-scale job you may have. But these MFPs do not suffer from a lack of quality in exchange for speed and capacity. The quality is incredibly high, ensuring that every print looks just as crisp as the last. A bad or aging copier should not come between you and efficiency in the office. Go to Caltronics.net today for more information about how to choose the best copier solution for you. This entry was posted in Uncategorized on June 29, 2016 by riehlt. Caltronics Business Systems has a wide array of copiers, along with customer service that shows that they truly care about every individual client and his or her needs. But Caltronics’ expertise does not end at copiers. An important part of any office is networking and IT. Now that email and the cloud are increasingly taking over for printing memos and faxing documents, it’s essential to have a team behind you that can ensure that your network is running smoothly at all times. Upgrading your company from a paper-based to a cloud-based one will make you much more environmentally friendly, as there will be an incredible amount of saved paper and ink. You are not only helping the environment when you move document management to the cloud; your bottom line will benefit as well. This is because putting all of the documents in the cloud and sharing them via the web saves so much money compared to printing everything. With the cost of ink and toner continuing to increase, the savings are even more magnified. You may not want to get on the cloud bandwagon because it seems so new, or you may have only heard about it from commercials and TV. But rest assured, the cloud is the most secure way to hold and maintain your documents. And with a trustworthy company like Caltronics helping your office to transition, you will be able to get up and running in no time. They can also manage your services to ensure you are getting the most out of it. Copiers are a necessary part of most any office, even if it is just one small unit to get very minor projects done, and Caltronics Business Systems has been trusted for copier services for years. When you look for a networking and IT company that can help turn your office into a truly twenty-first-century, fully cloud-based office, Caltronics will help you bridge the gap from the age of paper to the digital age. 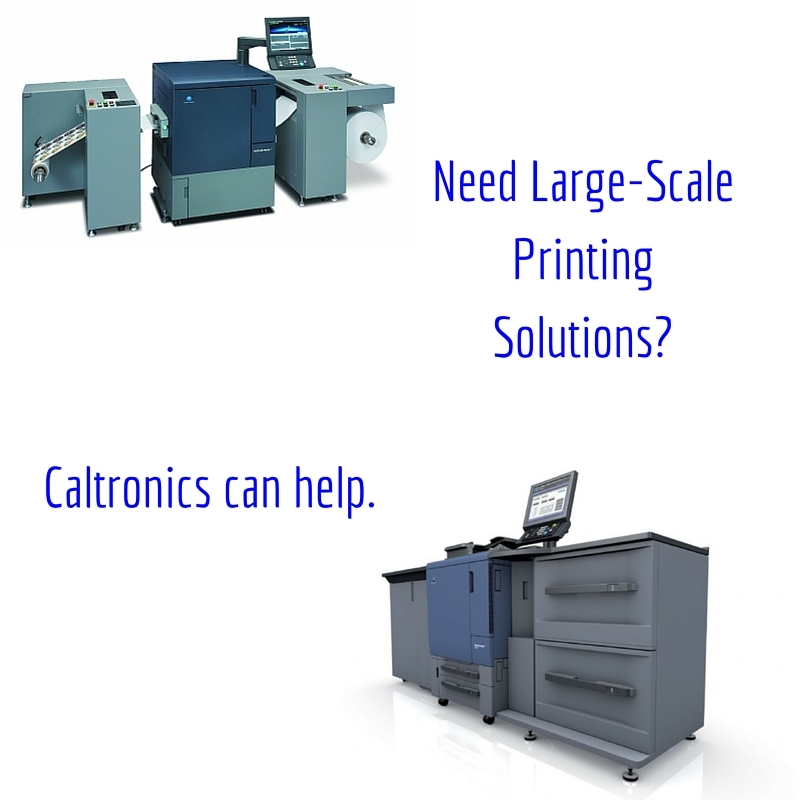 If you are interested in learning more about the services they offer, give Caltronics a call! This entry was posted in Uncategorized on June 23, 2016 by riehlt.